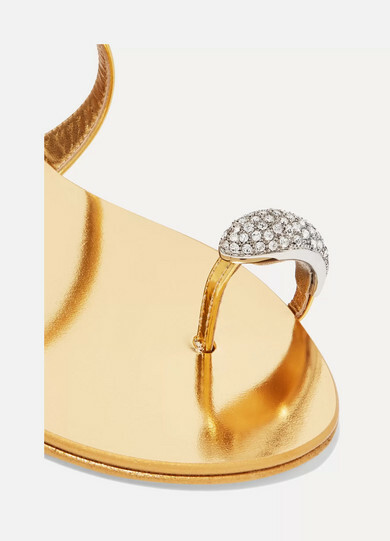 Giuseppe Zanotti's shoes are guaranteed to make even your most love-worn jeans look glamorous - virtually every pair has some kind of shimmering accent. 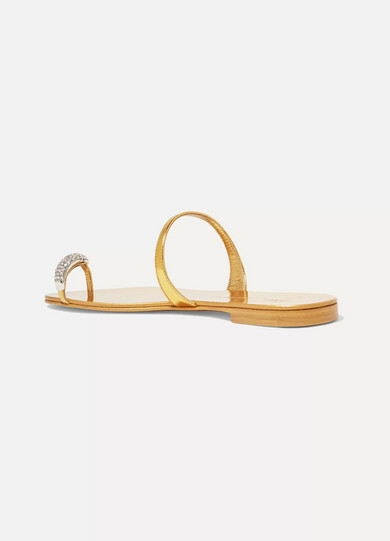 These 'Nuvorock' sandals are made from gold leather and have a single toe loop encrusted with light-reflecting crystals. They'll look just as cool on vacation as they will back in the city. Shown here with: Mes Demoiselles Dress, Rosantica Clutch, Sophie Buhai Earrings, Sophie Buhai Bangle, Paola Vilas Ring.